Game #9 in the Nancy Drew Adventure series. 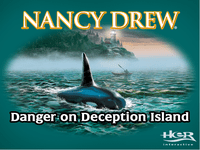 In Danger on Deception Island, you, as Nancy Drew®, are investigating a string of mysterious events on Deception Island. Try this adventure by foot, bike, and kayak! Navigate sea caves, boats, and the surrounding waters in your kayak. Hop on your bike to explore the Whale Center, Hot Kettle Cafe, and Lighthouse. Walk around town or hit the sandy beach to discover a lighthouse, build sandcastles and more! Plunge into danger to bring a mysterious island's secrets to the surface! Is the trouble related to the orphaned Orca whale, or is there a deeper threat?